Rooted honey and platinum blonde nice quality hair on a solid 2-part scalp. Eye mechanism: press down on empty pouch on dome of head to roll eyes and change eye colour. 4 eye colours: indigo looking right, green looking left, green looking up right, blue with stars looking straight ahead. The head is make of a hard plastic but very slightly flexible and very easily washable (stains just rub off). 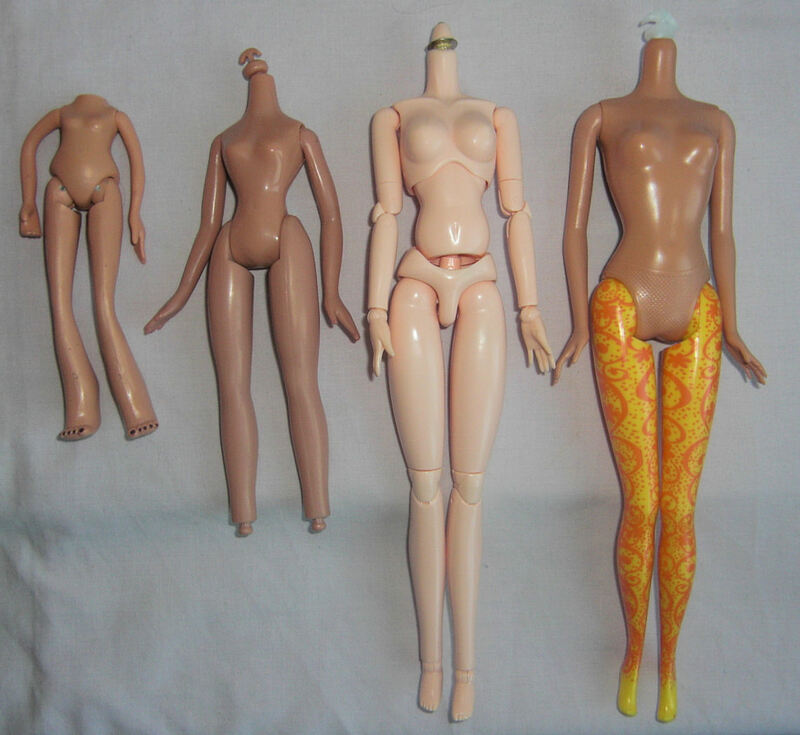 Her skin colour is and orangey tan like barbie. 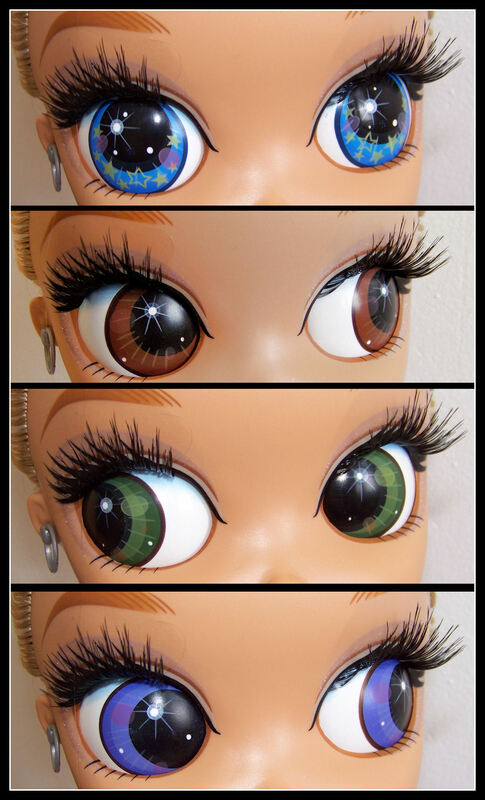 The faceup is very cute with lots of painted and real long lashes. The lips could be less pouty and more smiley but I don’t know if that would make her creepier! 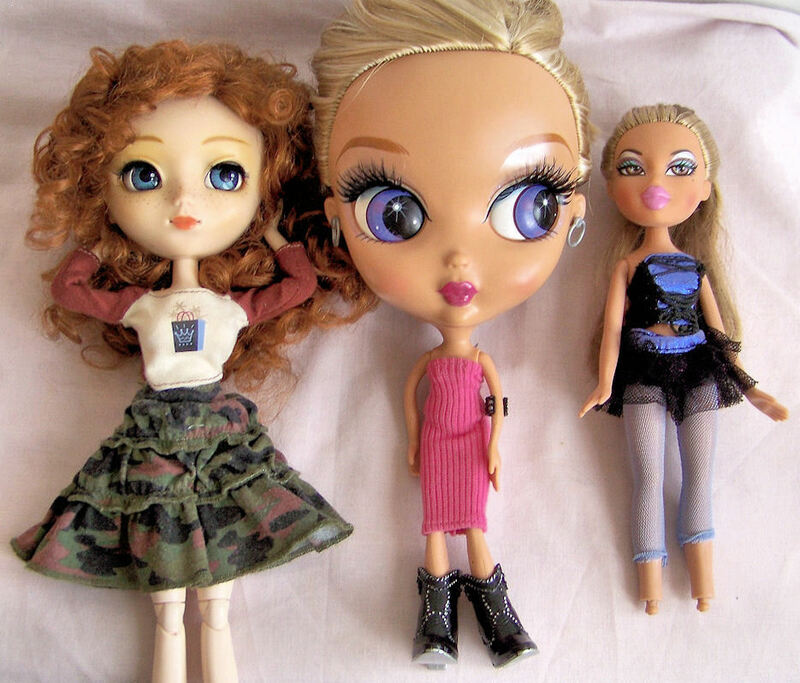 The stock body is smaller than bratz, bigger than lil bratz, has a rounded belly, a very small bust, bendable wired arms and legs and massive feet that don’t fit any fashion doll shoes. In her stock body she cannot stand alone or sit up straight unless strapped (clicked) into her special chair. 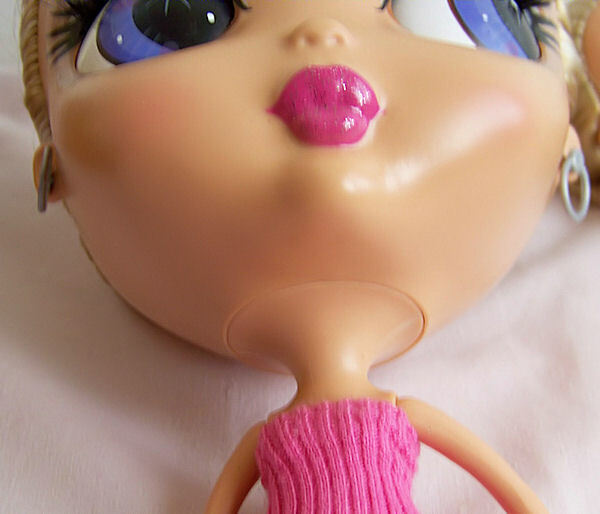 The head is joined on to the stock body via a 3cm diameter area at top of neck. Switching bodies is going to a difficult task. 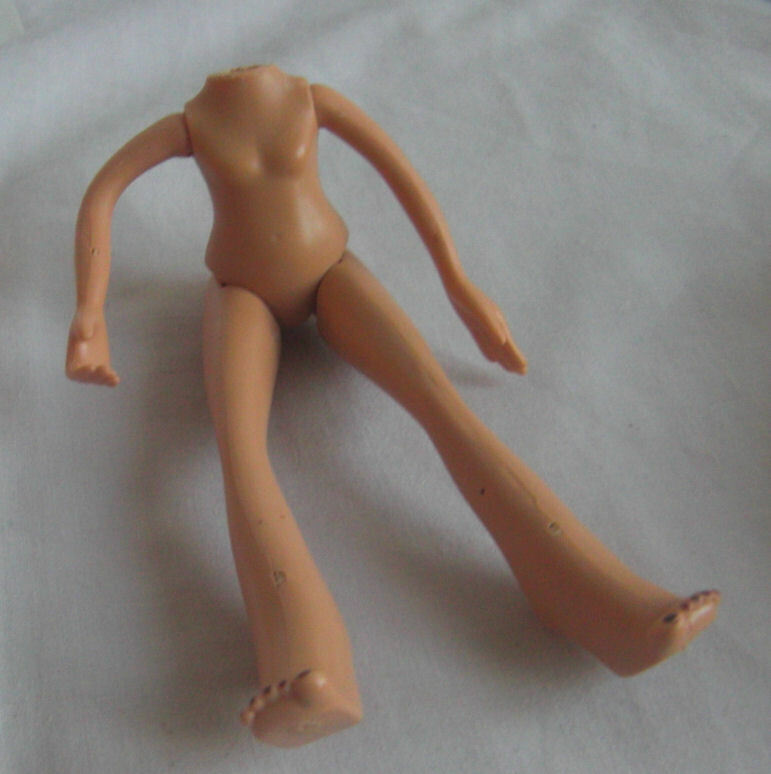 I sawed off her body at the neck and sawed off Barbie Gymnastic’s Body at half way down the neck. Pliers were used to twist and pull out plastic from inside the neck holes then a small cylinder of wood was sawn to size and inserted into both holes to make the joint more solid. I used superglue and waited 12 hours: the head cracked off within minutes of play so i’m re-doing a much thicker superglue neck joint which will be fairly visible. Ideally, I’d like to make a choker (my sister’s idea) with some sort of clay or epoxy to hold the body and head together, which will then be painted. I don’t have the supplies though so for the meantime we’re going with just glue. What’s motivating is that she’s really cute on a big body. I’m more of a “little doll” type of person but she is quite charming once you get used to the size of her… and her weight: she makes a pullip head seem like nothing. 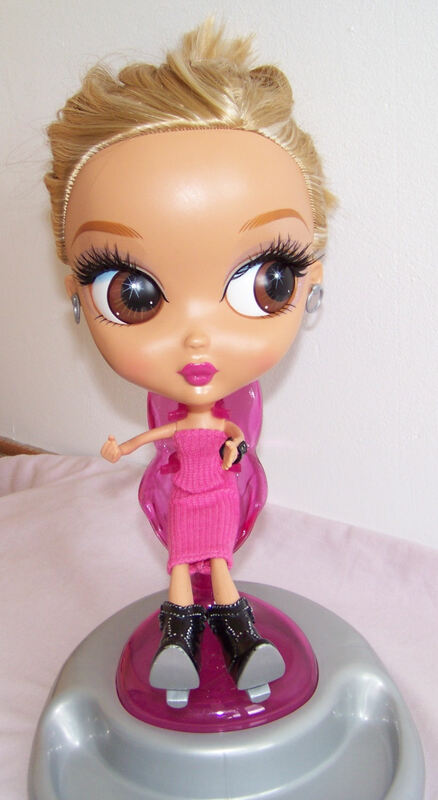 This entry was posted in Tutorials and tagged barbie, beauty cutie, experiments, hybrid on January 1, 2011 by saffy.